This is the entire decision of the court, except that most citations have been removed. The original may be read at 145 U.S. 285 (Volume 145 of United States Reports at page 285). MUTUAL LIFE INS. CO. OF NEW YORK et al. v. HILLMON. No. 181. MUTUAL LIFE INS. CO. OF NEW YORK v. SAME. No. 182. NEW YORK LIFE INS. CO. v. SAME. No. 183. CONNECTICUT MUT. LIFE INS. CO. OF HARTFORD, CONNECTICUT, v. SAME. No. 184. In error to the circuit court of the United States for the district of Kansas. Reversed. On July 13, 1880, Sallie E. Hillmon, a citizen of Kansas, brought an action against the Mutual Life Insurance Company, a corporation of New York, on a policy of insurance, dated December 10, 1878, on the life of her husband, John W. Hillmon, in the sum of $10,000, payable to her within 60 days after notice and proof of his death. On the same day the plaintiff brought two other actious,–the one against the New York Life Insurance Company, a corporation of New York, on two similar policies of life insurance, dated, respectively, November 30, 1878, and December 10, 1878, for the sum of $5,000 each; and the other against the Connecticut Mutual Life Insurance Company, a corporation of Connecticut, on a similar policy, dated March 4, 1879, for the sum of $5,000. In each case the declaration alleged that Hillmon died on March 17, 1879, during the continuance of the policy, but that the defendant, though duly notified of the fact, had refused to pay the amount of the policy, or any part thereof; and the answer denied the death of Hillmon, and alleged that he, together with John H. Brown and divers other persons, on or before November 30, 1878, conspiring to defraud the defendant, procured the issue of all the policies, and afterwards, in March and April, 1879, falsely pretended and represented that Hillmon was dead, and that a dead body which they had procured was his, whereas in reality he was alive and in hiding. On June 14, 1882, the following order was entered in the three cases: ‘It appearing to the court that the above-entitled actions are of like nature, and relative to the same question, and to avoid unnecessary cost and delay, and that it is reasonable to do so, it is ordered by the court that said actions be, and the same are hereby, consolidated for trial.’ To this order the defendants excepted. On February 29, 1888, after two trials at which the jury had disagreed, the three cases came on for trial, under the order of consolidation. Each of the defendants moved that the order be set aside, and each case tried separately; but the court overruled the motion, and directed that pursuant to that order, the cases should be tried as one cause, and to this each defendant excepted. At the impaneling of the jury each defendant claimed the right to challenge peremptorily three jurors. But the court ruled that, the cases having been consolidated, the defendants were entitled to three peremptory challenges only, and, after each defendant had peremptorily challenged one juror, ruled that none of the defendants could so challenge any other jurors; and to these rulings each defendant excepted. John Hillmon and Frederick Walters. At the trial plaintiff introduced evidence tending to show that on or about March 5, 1879, Hillmon and Brown left Wichita, in the state of Kansas, and traveled together through southern Kansas in search of a site for a cattle ranch; that on the night of March 18th, while they were in camp at a place called ‘Crooked Creek,’ Hillmon was killed by the accidental discharge of a gun; that Brown at once notified persons living in the neighborhood, and that the body was thereupon taken to a neighboring town, where, after an inquest, it was buried. The defendants introduced evidence tending to show that the body found in the camp at Crooked creek on the night of March 18th was not the body of Hillmon, but was the body of one Frederick Adolph Walters. 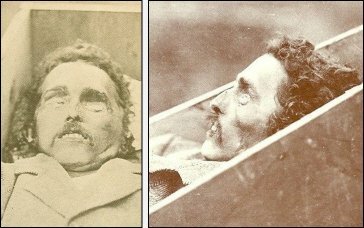 Upon the question whose body this was there was much conflicting evidence, including photographs and descriptions of the corpse, and of the marks and scars upon it, and testimony to its likeness to Hillmon and to Walters. ‘Witness further testified that she had received a letter written from Wichita, Kansas, about the 4th or 5th day of March, 1879, by her brother Frederick Adolph; that the letter was dated at Wichita, and was in the handwriting of her brother; that she had searched for the letter, but could not find the same, it being lost; that she remembered and could state the contents of the letter. Alvina D. Kasten testified that she was 21 years of age, and resided in Ft. Madison; that she was engaged to be married to Frederick Adolph Walters; that she last saw him on March 24, 1878, at Ft. Madison; that he left there at that time, and had not returned; that she corresponded regularly with him, and received a letter about every two weeks until March 3, 1879, which was the last time she received a letter from him; that this letter was dated at Wichita, March 1, 1879, and was addressed to her at Ft. Madison, and the envelope was postmarked ‘Wichita, Kansas, March 2, 1879;’ and that she had never heard from or seen him since that time. The defendants put in evidence the envelope with the postmark and address, and thereupon offered to read the letter in evidence. The plaintiff objected to the reading of the letter. The court sustained the objection, and the defendants excepted. Rulings upon other questions of evidence excepted to at the trial are not reported, because not passed upon by this court. The jury, being instructed by the court to return a separate verdict in each case, returned verdicts for the plaintiff against the three defendants respectively for the amounts of their policies and interest, upon which separate judgments were rendered. The defendants sued out four writs of error, one jointly in the three cases as consolidated, and one in each case separately. Julien T. Davies, for plaintiffs in error Mutual Life Ins. Co. and New York Life Ins. Co.
Edwd. S. Isham, for plaintiff in error Connecticut Mutual Life Ins. co.
Samuel A. Riggs and L. B. Wheat, for defendant in error. The consolidation rule, introduced in England by Lord MANSFIELD, to avoid the expense and delay attending the trial of a multiplicity of actions upon the same question arising under different policies of insurance, enabled the several insurers to have proceedings stayed in all actions except one, upon undertaking to be bound by the verdict in that one, to admit all facts not meant to be seriously disputed, and not to file a bill in equity or bring a writ of error; and was considered as a favor to the defendants; and insurers under different policies could not obtain such a rule without the plaintiff’s consent. Where the English consolidation rule has not been adopted, the American courts, state and federal, have exercised the authority of ordering several actions by one plaintiff against different defendants to be tried together whenever the defense is the same, and unnecessary delay and expense will be thereby avoided. The learning and research of counsel have produced no instance in this country in which such an order, made in the exercise of the discretionary power of the court, unrestricted by statute, has been set aside on bill of exceptions or writ of error. But, although the defendants might lawfully be compelled, at the discretion of the court, to try the cases together, the causes of action remained distinct, and required separate verdicts and judgments; and no defendant could be deprived, without its consent, of any right material to its defense, whether by way of challenge of jurors or of objection to evidence, to which it would have been entitled if the cases had been tried separately. Section 819 of the Revised Statutes provides that in all civil cases ‘each party shall be entitled to three peremptory challenges; and in all cases where there are several defendants or several plaintiffs the parties on each side shall be deemed a single party for the purposes of all challenges under this section.’ Under this provision, defendants sued together upon one cause of action would be entitled to only three peremptory challenges in all. But defendants in different actions cannot be deprived of their several challenges by the order of the court, made for the prompt and convenient administration of justice, that the three cases shall be tried together. The denial of the right of challenge, secured to the defendants by the statute, entitles them to a new trial. There is, however, one question of evidence so important, so fully argued at the bar, and so likely to arise upon another trial, that it is proper to express an opinion upon it. This question is of the admissibility of the letters written by Walters on the first days of March, 1879, which were offered in evidence by the defendants, and excluded by the court. In order to determine the competency of these letters it is important to consider the state of the case when they were offered to be read. 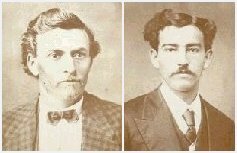 The matter chiefly contested at the trial was the death of John W. Hillmon, the insured; and that depended upon the question whether the body found at Crooked creek on the night of March 18, 1879, was his body or the body of one Walters. Much conflicting evidence had been introduced as to the identity of the body. The plaintiff had also introduced evidence that Hillmon and one Brown left Wichita, in Kansas, on or about March 5, 1879, and traveled together through southern Kansas in search of a site for a cattle ranch; and that on the night of March 18th, while they were in camp at Crooked creek, Hillmon was accidentally killed, and that his body was taken thence and buried. The defendants had introduced evidence, without objection, that Walters left his home and his betrothed in Iowa in March, 1878, and was afterwards in Kansas until March, 1879; that during that time he corresponded regularly with his family and Lis betrothed; that the last letters received from him were one received by his betrothed on March 3d, and postmarked at ‘Wichita, March 2,’ and one received by his sister about March 4th or 5th, and dated at Wichita a day or two before; and that he had not been heard from since. The evidence that Walters was at Wichita on or before March 5th, and had not been heard from since, together with the evidence to identify as his the body found at Crooked creek on March 18th, tended to show that he went from Wichita to Crooked creek between those dates. Evidence that just before March 5th he had the intention of leaving Wichita with Hillmon would tend to corroborate the evidence already admitted, and to show that he went from Wichita to Crooked creek with Hillmon. Letters from him to his family and his betrothed were the natural, if not the only attainable, evidence of his intention. The position taken at the bar that the letters were competent evidence, within the rule as memoranda made in the ordinary course of business, cannot be maintained, for they were clearly not such. But upon another ground suggested they should have been admitted. A man’s state of mind or feeling can only be manifested to others by countenance, attitude, or gesture, or by sounds or words, spoken or written. The nature of the fact to be proved is the same, and evidence of its proper tokens is equally competent to prove it, whether expressed by aspect or conduct, by voice or pen. When the intention to be proved is important only as qualifying an act, its connection with that act must be shown, in order to warrant the admission of declarations of the intention. But whenever the intention is of itself a distinct and material fact in a chain of circumstances, it may be proved by contemporaneous oral or written declarations of the party. The existence of a particular intention in a certain person at a certain time being a material fact to be proved, evidence that he expressed that intention at that time is as direct evidence of the fact as his own testimony that he then had that intention would be. After his death these can hardly be any other way of proving it, and while he is still alive his own memory of his state of mind at a former time is no more likely to be clear and true than a bystander’s recollection of what he then said, and is less trustworthy than letters written by him at the very time and under circumstances precluding a suspicion of misrepresentation. The letters in question were competent not as narratives of facts communicated to the writer by others, nor yet as proof that he actually went away from Wichita, but as evidence that, shortly before the time when other evidence tended to show that he went away, he had the intention of going, and of going with Hillmon, which made it more probable both that he did go and that he went with Hillmon than if there had been no proof of such intention. In view of the mass of conficting testimony introduced upon the question whether it was the body of Walters that was found in Hillmon’s camp, this evidence might properly influence the jury in determining that question. In accordance with this rule, a bankrupt’s declarations, oral or by letter, at or before the time of leaving or staying away from home, as to his reason for going abroad, have always been held by the English courts to be competent, in an action by his assignees against a creditor, as evidence that his departure was with intent to defraud his creditors, and therefore an act of bankruptcy. The highest courts of New Hampshire and Massachusetts have held declarations of a servant, at the time of leaving his master’s service, to be competent evidence, in actions between third persons, of his reasons for doing so. And the supreme court of Ohio has held that, for the purpose of proving that a person was at a railroad station intending to take passage on a train, previous declarations made by him at the time of leaving his hotel were admissible. In actions for criminal conversation, letters by the wife to her husband or to third persons are competent to show her affection towards her husband, and her reasons for living apart from him, if written before any misconduct on her part, and if there is no ground to suspect collusion. Trelawney v. Colman, 2 Stark. 191, and I Barn. & Ald. 90; Willis v. Bernard, 5 Car. & P. 342, and 1 Moore & S. 584, 8 Bing. 376; 1 Greenl. Ev. 102. So letters from a husband to a third person, showing his state of feeling, affection, and sympathy for his wife, have been held by this court to be competent evidence, bearing on the validity of the marriage, when the legitimacy of their children is in issue. Even in the probate of wills, which are required by law to be in writing, executed and attested in prescribed forms, yet, where the validity of a will is questioned for want of mental capacity, or by reason of fraud and undue influence, or where the will is lost, and it becomes necessary to prove its contents, written or oral evidence of declarations of the testator before the date of the will has been admitted, in Massachusetts and in England, to show his real intention as to the disposition of his property, although there has been a difference of opinion as to the admissibility, for such purposes, of his subsequent declarations. In Sugden v. St. Leonards, which arose upon the probate of the lost will of Lord Chancellor St. Leonards, the English court of appeal was unanimous in holding oral as well as written declarations made by the testator before the date of the will to be admissible in evidence. Lord Chief Justice COCKBURN said: ‘I entertain no doubt that prior instructions, or a draft authenticated by the testator, or verbal declarations of what he was about to do, though of course not conclusive evidence, are yet legally admissible as secondary evidence, of the contents of a lost will.’ 1 Prob. Div. 226. Sir GEORGE JESSEL, M. R., said: ‘It is not strictly evidence of the contents of the instrument, it is simply evidence of the intention of the person who afterwards executes the instrument. It is simply evidence of probability,–no doubt of a high degree of probability in some cases, and of a low degree of probability in others. The cogency of the evidence depends very much on the nearness in point of time of the declaration of intention to the period of the execution of the instrument.’ Id. 242. Lord Justice MELLISH said: ‘The declarations which are made before the will are not, I apprehend, to be taken as evidence of the contents of the will which is subsequently made; they obviously do not prove it; and wherever it is material to prove the state of a person’s mind, or what was passing in it, and what were his intentions, there you may prove what he said, because that is the only means by which you can find out what his intentions were.’ Id. 251. Upon an indictment of one Hunter for the murder of one Armstrong at Camden, the court of errors and appeals of New Jersey unanimously held that Armstrong’s oral declarations to his son at Philadelphia, on the afternoon before the night of the murder, as well as a letter written by him at the same time and place to his wife, each stating that he was going with Hunter to Camden on business, were rightly admitted in evidence. Chief Justice BEASLEY said: ‘In the ordinary course of things, it was the usual information that a man about leaving home would communicate, for the convenience of his family, the information of his friends, or the regulation of his business. At the time it was given, such declarations could, in the nature of things, mean harm to no one. He who uttered them was bent on no expedition of mischief or wrong, and the attitude of affairs at the time entirely explodes the idea that such utterances were intended to serve any purpose but that for which they were obviously designed. If it be said that such notice of an intention of leaving home could have been given without introducing in it the neme of Mr. Hunter, the obvious answer to the suggestion, I think, is that a reference to the companion who is to accompany the person leaving is as natural a part of the transaction as is any other incident or quality of it. If it is legitimate to show by a man’s own declarations that he left his home to be gone a week, or for a certain destination, which seems incontestable, why may it not be proved in the same way that a designated person was to bear him company? At the time the words were uttered or written they imported no wrongdoing to any one, and the reference to the companion who was to go with him was nothing more, as matters then stood, than an indication of an additional circumstance of his going. If it was in the ordinary train of events for this man to leave word or to state where he was going, it seems to me it was equally so for him to say with whom he was going.’ Hunter v. State, 40 N. J. Law, 495, 534, 536-538. Upon principle and authority, therefore, we are of opinion that the two letters were competent evidence of the intention of Walters at the time of writing them, which was a material fact bearing upon the question in controversy; and that for the exclusion of these letters, as well as for the undue restriction of the defendants’ challenges, the verdicts must be set aside, and a new trial had.